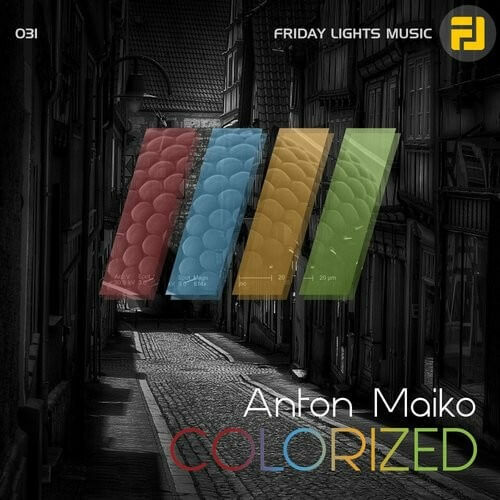 Friday Lights Music is proud to introduce ‘Anton Maiko’ with his fine EP ‘Colorized’. On our 31st release we continuing a journey through combined styles of Techno and Progressive House with easy flowing and crystalizing sounds. Anton Maiko is widely known in progressive trance scene as ‘Mindwave’. After 5 albums, dozens of EP’s and hundreds of worldwide gigs Anton is slowing down with this side project and really showing us how to do deep and pure synthesis in the land of 120 bpm. ‘Colorized’ is energizing and unstoppable track with sparkling leads and saw-acid bass line. The hall atmosphere of the track is about making you smile and making you move to the flow. With the teasing little break is truly a summer gem. ‘Urban Night’ is really groovy and mirroring the title track. It starts with accurate rhythm section, long lazy synths with big delays and sample of city life ambience – and exactly when you think you got the point of the track – the FAT bass is there to pump things up. Slapping rhythm section is really turning this track into something special.